Epic Mine is a pixel-cubic style arcade game from Black Temple with a fun plot that will appeal to adventurers. In the game, you take on the role of a miner. On one ordinary clear day, everyone is busy at the mines when suddenly an explosion occurs. This causes the mines to cave in. The main character was near the exit and managed to escape. However, all his bearded miner friends remain trapped. With a pickaxe in hand, he decides to advance into the depths of the mines to rescue all miners who are trapped under the rubble. Whether you choose to install Epic Mine on PC or Android, learning the basic gameplay mechanics is easy. You will descend into mines and start breaking walls that prevent your main character from passing. In the beginning, the only tool available is a wooden pickaxe. The game has a total of 50 pickaxes. A blacksmith can craft new pieces for a price. Later on, you will be able to blow up the walls with dynamite, dissolve them with acid or use magic spells that melt and freeze through the barriers. There are plenty of mines and catacombs to explore. Each one consists of multiple tiers, which culminate with a boss challenge. Epic Mine adds another layer of fun to the game with its trading and resource management system. When walls break, you gather stone, gold, bismuth, and other resources. The workshop is where you can smelt collected ores into ingots. Selling your treasure to the in-game merchant is a good way to get crystals for upgrading skills and tools. 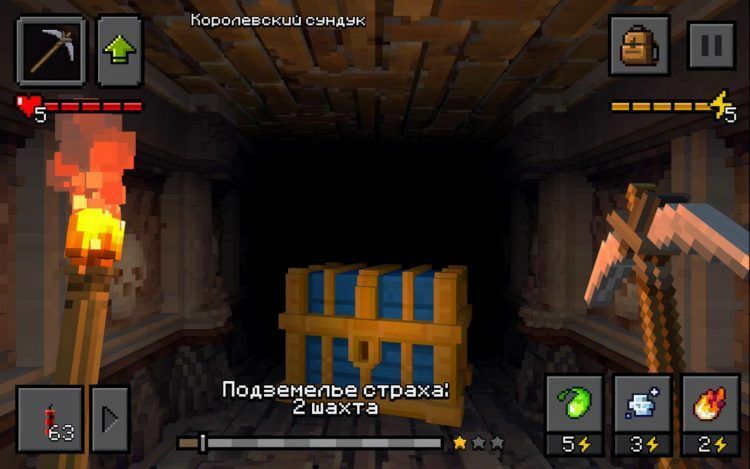 When taking down walls, players also earn treasure chests. Both wooden and royal chests come with bonus rewards. You can spend your resources on skill development. But remember, the ability to manage resources and sell everything for profit is the key to success. When breaking a wall, you will see markings that look like colored squares. There is also a red stripe that moves across the surface in a vertical or horizontal direction at different speeds depending on the level. You can only knock down walls when the red stripe hits the colored squares. Therefore, make sure to strike at the precise time. Hitting the wall deals some amount of damage to your mining tool. To increase the health of your pickaxe, strike the red squares that appear on the wall. This will add one heart to your pickaxe health. When playing Epic Mine on PC, you can opt to watch short video advertisements in exchange for various rewards or advantages. For instance, watching an ad clip can double your ingots or reduce the chest-opening wait time by 30 minutes. The team at Black Temple has promised to make Epic Mine better in the future by adding new and interesting things. The developers have hinted at possibly introducing multiplayer mode and guilds. So, make sure to keep checking for updates if you want to enjoy the latest content that Epic Mine has to offer. Go to the search box in Bluestacks and type “Epic Mine” without the quotes, of course. That is it! You can now enjoy your freshly installed copy of “Epic Mine” on your favorite PC!